STMicroelectronics has unveiled a plug-and-play wireless battery-charger development kit (STEVAL-ISB045V1), that allow users quickly build ultra-compact chargers which can change up to2.5W. The dev kit has a space-saving 20 mm-diameter coil which can be used for charging small IoT devices and wearables such as smart watches, sports gear, or healthcare equipment. 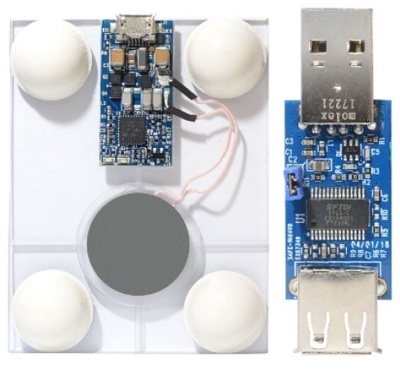 Built around the STWBC-WA wireless charging-transmitter controller, the kit consists of a charging base unit containing a transmitter board with the 20 mm coil already connected and ready to use. Getting started is easy, using the PC-based STSW-STWBCGUI software to configure the STWBC-WA and monitor runtime information such as power delivered, bridge frequency, demodulation quality, and protocol status. The kit includes a dongle for running the GUI. The supporting ecosystem includes certified reference boards, software, and detailed documentation to help developers quickly deliver the smallest and best-performing chargers into fast-growing new markets for smart objects and wearables. The STWBC-WA controller chip contains integrated drivers and natively supports full-bridge or half-bridge topologies for powering the antenna. The half-bridge option allows charging up to 1W with a smaller-diameter coil for an even more compact form factor. The chip supports all standard wireless-charging features, including Foreign Object Detection (FOD) and active presence detection for safe charging, and uses digital feedback to adapt the transmitted power for optimum efficiency at all load conditions. Two firmware options give users the choice of a fast turnkey solution or customizing the application using APIs to access on-chip peripherals including an ADC, a UART, and GPIOs. The STEVAL-ISB045V1 kit is available now.